The drive through the hills in the early evening light should have been soothing, but I was too excited to appreciate the sun-dappled trees and the familiar curves in the road. I was driving to meet a friend, one of my last ties to this place. I parked my car and crossed the street to where Bill was waiting, guitar in hand. We exchanged quick hugs, a pleasantry or two, and as always, it was like we hadn’t spent a day apart. Bill sat down on the brittle grass and started tuning his guitar. “A few years ago,” he said around the pick between his teeth, “people just stopped coming.” He struck a chord, adjusted a peg, and began to play. I settled on the ground to listen. The notes sounded disjointed, almost unearthly, but what did I know about jazz? He shifted modes, and the music coalesced into chaos. Lights whirled, children shrieked. 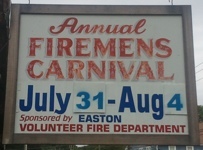 The Volunteer Firemen’s Carnival was in full swing. I had come to expect small magics whenever Bill played, but this was sorcery of the highest caliber. I saw familiar faces everywhere: at the bingo table, the ticket booth, the ferris wheel. Childhood friends who had disappeared years ago into their grown-up lives. One figure spotted us, gestured urgently. “I thought Len was in Philly!” I said, waving back. “You’ve outdone yourself, Bill.” Len gestured again. The notes faded away, and I waited for things to return to normal. They didn’t. The look on Len’s face was stricken. I realized he wasn’t beckoning me. He was warding me off. By the way, if you’d like to see what I mean about magic, check out the real Bill’s YouTube channel. Bill Bartosik is a fabulous jazz guitarist, and an all around awesome person (not creepy at all). Oh my goodness did I enjoy this story. Very capturing. Oooooh. I got a legitimate shiver there. Sweet! 🙂 I didn’t actually start out with the intention of making Bill creepy. He isn’t at all, really. terrific build-up and i did get a shiver. This is a great story. It didn’t come across to me that Bill’s influence was negative. Len wasn’t happy but it seemed like Bill was trying to do something nice for you. If this were the opening line prompt, I’d say I want to read more. Ok, I’ll say it anyway, I want to read more!! I’m sort of cringing because, I re-read this, and my take on this was a bit naive. But I have this bias for the positive side of things! Anyway, great writing. Oh! HUGE compliment, thank you! Ooo. Creepy. Very Stephan King -esque. Nice job. I absolutely LOVE this story. It sent tingles down my spine. Your writing is so exquisite. I just am a huge fan. You conveyed the eerie vibe of a traveling carnival very well. I could see this unfold like a movie in my mind through your words. Lovely work. Thanks for sharing it with us. We hope to see you back tomorrow for the new challenge. Creepy, and I loved it. What a twist in the ending, beautifully done! Hi I’m Bill from the story. My vote: I’m creepy. Oh, in the story, of course. This reminded me of a Stephen King short, really well done. Another one where you can ‘see’ the story almost immediately. That ending was completely unexpected. This was a read well worth coming for: I wish I could have written it. Awesome. 🙂 I will have to feature my friends more often.